Saddam was overthrown in April 2003 following the US-led invasion of Iraq, and executed for crimes against humanity in 2006. But over a decade after his death, Saddam’s legacy remains a divisive issue. The instability in Iraq, caused in part by the war, means that some Iraqis long for the security of tyrannical rule, while others cannot forget the extreme brutality he unleashed on the Iraqi people. Saddam Hussein fostered a personality cult during his rule to inspire devotion from the Iraqi people. His image was widely circulated and proliferated a range of public spaces. Britain and the US seized the chance to undermine Saddam’s public support during the Gulf War in 1990, by circulating anti-Saddam propaganda. On this leaflet, the text reads ‘The Mother of All Evil’ in both English and Arabic. 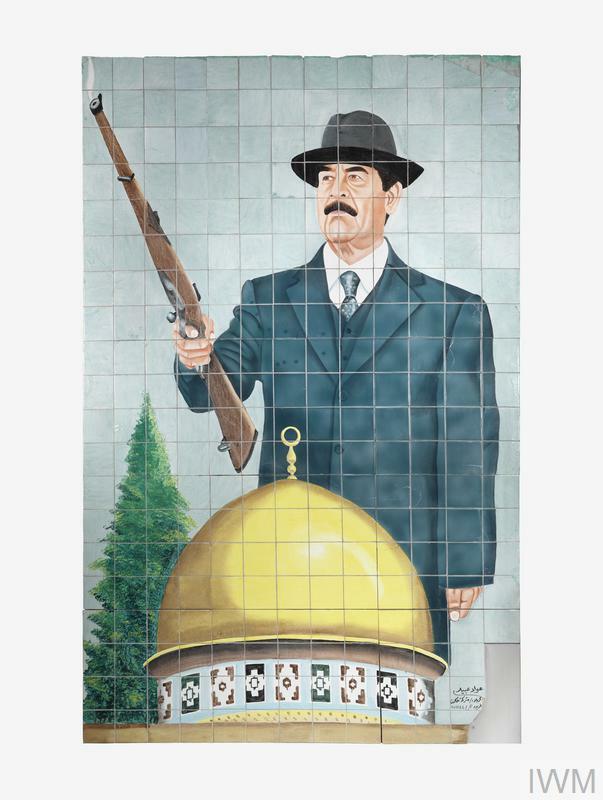 Saddam’s image was also widely manipulated in Iraq, he depicted himself in a range of garb from traditional dress to modern business suits to appeal to different aspects of Iraqi society. Western powers also caricatured his image as a way to mock him. 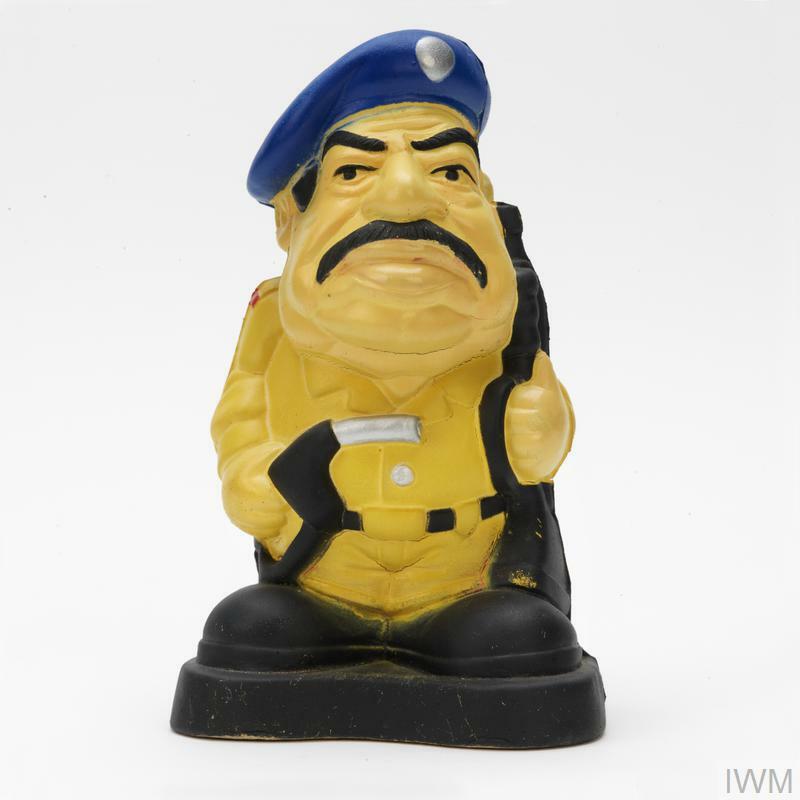 This British-produced dog toy was manufactured during the Gulf War in 1990, the toy holds a petrol hose to parody Saddam’s control over Iraq’s oil assets. The US Invaded Iraq in March 2003 to disarm the country of weapons of mass destruction and end Saddam Hussein's support for terrorism. 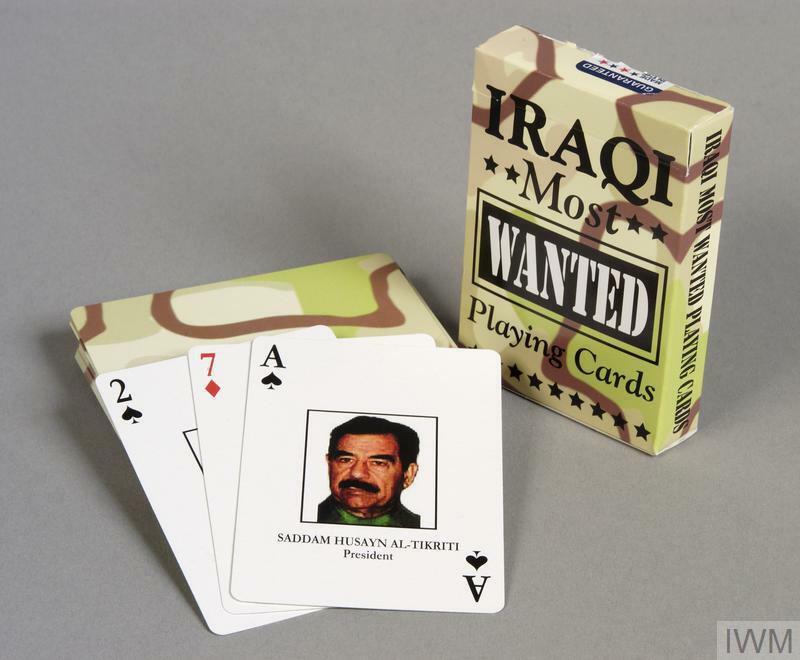 The US Department of Defence developed these ‘most wanted’ playing cards to help forces identify members of Saddam’s Regime. Saddam Hussein, as the most powerful, and most wanted person, appeared on the Ace of Spades, the highest ranking card in the pack. ‘Iraq’s most wanted’ playing cards, 2003. Portraits of Saddam Hussein were common sights on the streets of Iraq, displayed everywhere from town squares, to schools, bus stops and cafes. Following the fall of Saddam, many civilians who feared and detested their former ruler wanted these images removed. This mural was taken from the entrance of Umm Qsar port in Iraq in March 2003 by the Royal Logistics corps at the request of local people. At the same time, souvenirs of Saddam Hussein’s rule also became highly profitable. April 2003 saw a flood of Saddam related memorabilia appear on online auction sites. 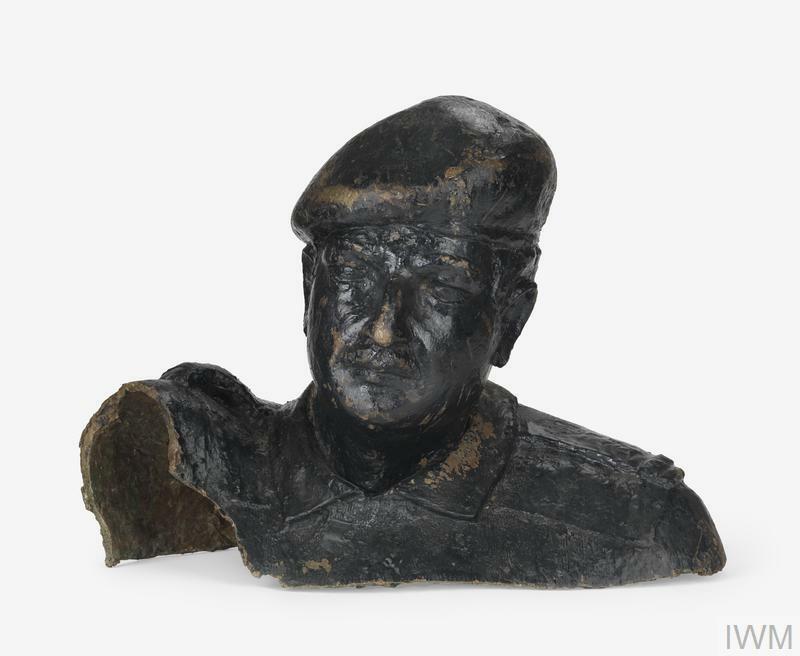 Pieces of broken statues, Iraqi currency depicting his face, and even looted cutlery from his palaces were all purchased for considerable sums on eBay. 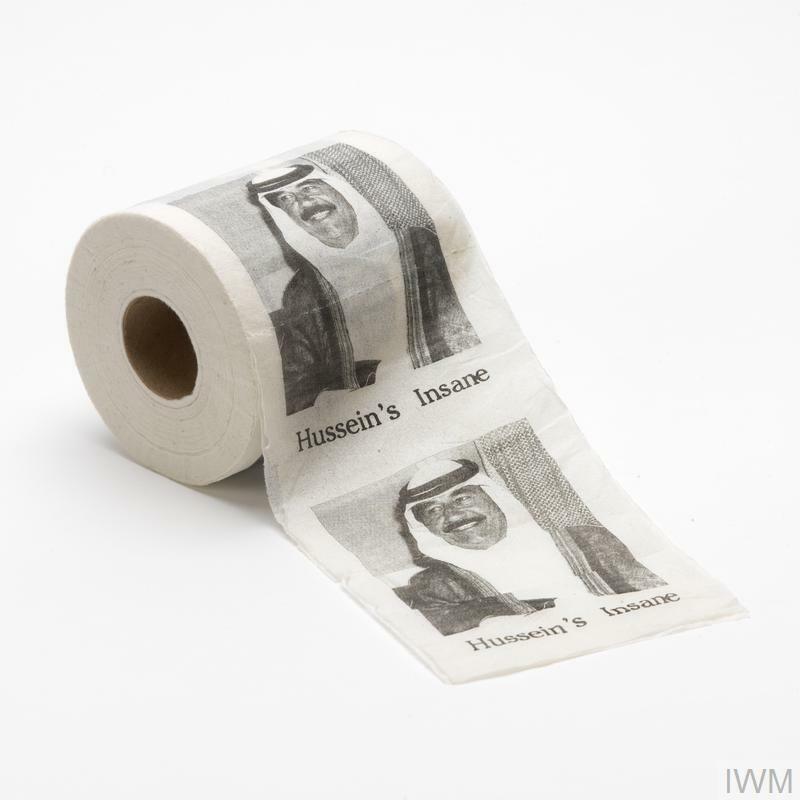 Curios from earlier conflicts, like this anti-Saddam toilet paper made during the Gulf War in 1991, also became very popular collectables, despite their less than reverential depiction of the leader! Saddam Hussein Toilet Paper, 1991. Saddam’s fall was mirrored in the enthusiastic destruction of his image by the Iraqi people. Statues like this bust, were often destroyed and damaged by locals. The toppling of Saddam’s statue in Firdos Square, Baghdad by civilians and US forces was widely broadcast in the media. Locals reportedly pelted the image of Saddam with shoes and even urinated on it after its fall. 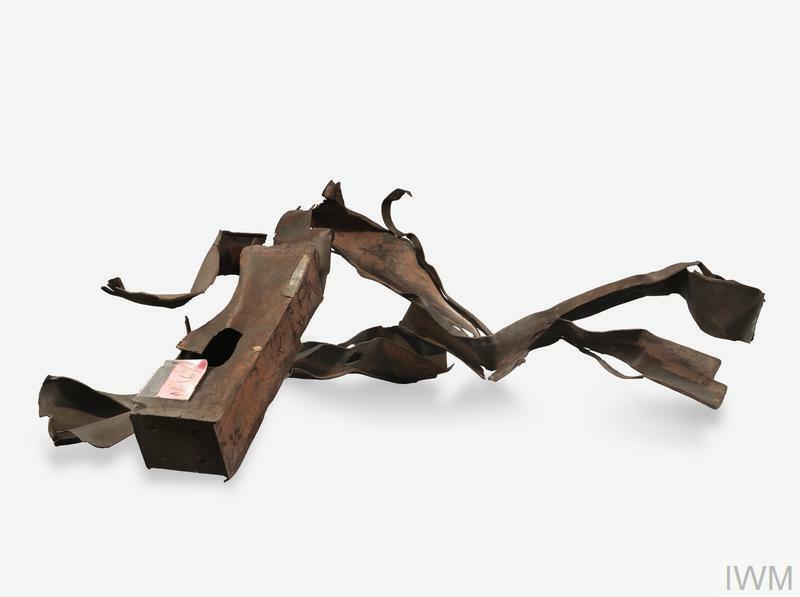 'Saddam is Here' was on display at IWM London as part of Age of Terror: Art since 9/11 until 28th May 2018. 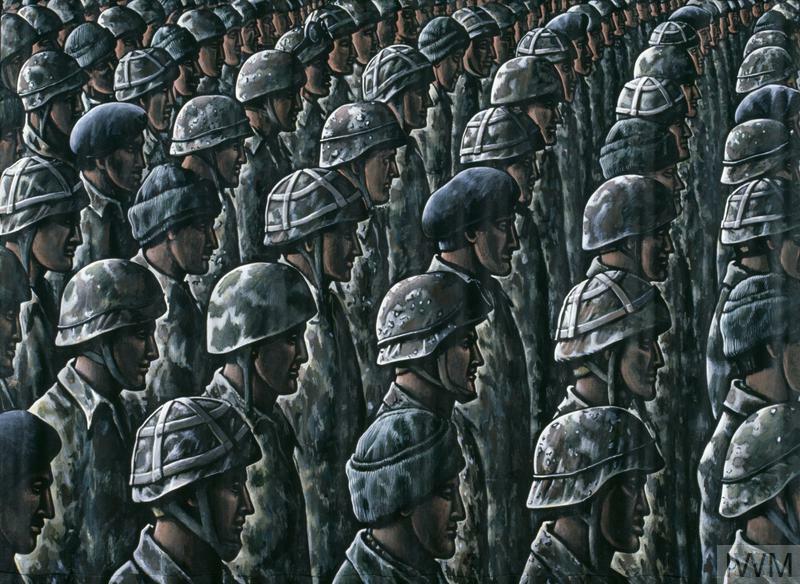 On 15 February 2003, mass marches were held to protest against a planned invasion of Iraq led by the United States. The invasion was part of an aggressive American military strategy against extremist Islamic terrorism following the 9/11 attacks in 2001. On the morning of 11 September 2001, 19 al-Qaeda terrorists hijacked four commercial passenger planes in the United States. Two planes were flown into the Twin Towers of the World Trade Center in New York City, causing both towers to collapse. A third plane was crashed into the Pentagon. What Was The Gulf War? On 2 August 1990 Iraqi dictator Saddam Hussein invaded Kuwait, a tiny oil-producing state in the Persian Gulf. The response of the international community was swift. The United Nations demanded Iraqi withdrawal and imposed a trade embargo.